What's the most popular type of card you make? Even though I tend to make a lot of generic cards - useful for any situation - birthday cards probably still make up the bulk of cards I make and use for myself. I love being able to customise a birthday card to the person I'm giving it to. Usually I have enough time in advance to make them, but it's always useful to have a few in my card box, ready for unexpected or previously unknown about birthdays. Here's one I made recently. I decided to use lots of textures in this card. The bottom third of the card is embossed using a big shot embossing folder. 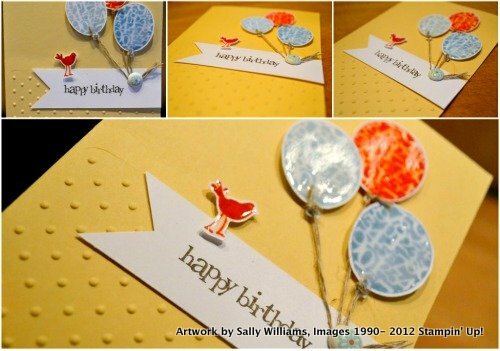 I also added layers of stamped card stock, stamped and hand cut balloons, string, brads and raised stamped birds. I used crystal effects on the balloons and bird to give it some extra gloss and shine. This was a quick and easy card to make (except for the drying time of the crystal effects), but could work for a boy or a girl. It's a great one to have in your card box ready to add to a present for a friend or family member. In fact if you like it you can head on over to my madeit.com.au store and purchase it for $3.50 (+ postage). If you like this card are want to make one yourself now is a great time to order from me. Until March 31 for every $100 you spend on Stampin' Up! products you receive a free stamp set, or accessories from the Sale-a-bration brochure. Check it out here. If you want to grab some of the products I used in this card (and some freebies) just send me an email to info@sallycancraft.com and I can help you out.